Kevin Hart laughed as he tried to floss dance with a kid as they were both egged on by rapper Meek Mill. Philadelphia Eagles owner Jeffrey Lurie awkwardly waved his arms around the way any 60-something-year-old man would attempting to look hip next to star entertainers. This postseason potpourri of comic, ex-con and champion unfolded on the sideline of another 76ers’ romp. Mill, the Philadelphia-born rapper released from prison only hours earlier, snagged the Game 5 headlines. Ben Simmons, Joel Embiid and the rest of the Sixers stole the show. Embiid and Simmons shined again in front of Mill, and the dominant duo ushered the nightmares-into-dreams Process of the Philadelphia 76ers into the second round with a 104-91 win over the Miami Heat on Tuesday night. The 76ers, winners of 10 games just two seasons ago, are in the second round of the Eastern Conference playoffs for the first time since 2012. The Sixers won the series 4-1 and turned the Wells Fargo Center into the wildest house party in the city. “I’ve been waiting for this moment,” Embiid said. 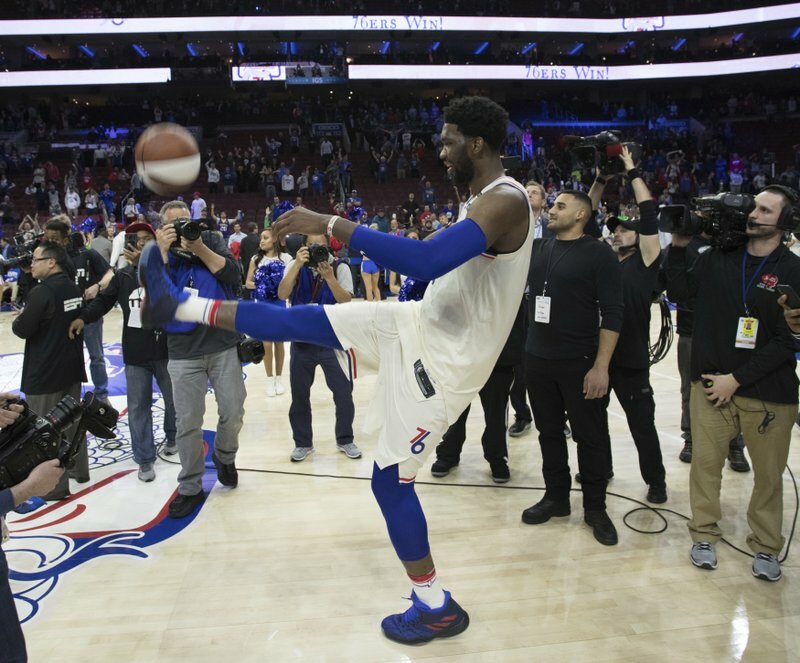 The Sixers are the latest team to sweep up the city in a sports euphoria that hasn’t died down since the Eagles beat the New England Patriots to win the Super Bowl. Look around the arena, and the champs were all around. Lurie was in the house and so were a handful of Eagles. The national champion Villanova Wildcats were feted during the game. The Wildcats posed with Mill in the locker room and then stopped for selfies on the way to the court for a brief celebration. The city has already thrown two championship parades this year — the 76ers have played like a team that could add one more. Embiid, who came to personify the Process, had his second consecutive double-double and tallied 56 points, 31 rebounds and nine blocks in just three playoff games. Embiid again played in a black mask to guard a face injury, and he’ll have plenty of time to rest and recover with the other Eastern Conference playoff series expected to stretch into the weekend. Here’s what else to know about the 76ers in the postseason. This was no run-of-the-mill Game 5 victory for the Sixers. Mill was there just hours after being released from prison. He was brought by helicopter to Philadelphia, where he rang the ceremonial bell to start the game. Mill sat courtside next to Hart and Sixers co-owner Michael Rubin. Rubin had organized prison trips with Embiid, Simmons and Markelle Fultz to support Mill, and the rapper’s songs played in the locker room and during warmups. The 76ers caused a few eyes to roll around the league when they signed free-agent guard JJ Redick to a $23 million, one-year deal in the offseason. Redick was coming off a solid four-year run with the Clippers, but even by NBA standards, the Sixers appeared to overpay for the 3-point ace. Redick has been worth every dollar, and he delivered again in Game 5. He made 5 of 10 3 pointers, all 10 free throws and scored a game-high 27 points. It was the second time this postseason that Redick scored at least 27 points and the third time in his playoff career. He had consecutive 20-point games in the postseason for the first time in his career. All four goals have been reached. Simmons had 14 points and 10 rebounds for his fourth double-double of the series. He is the first rookie to post at least four double-doubles in his first five postseason games since San Antonio’s Tim Duncan in 1997-98. Simmons was a force against the Heat. He had 91 points, 53 rebounds and 45 assists in the series and showed why he’s the favorite to win the NBA rookie of the year. “This is what I’m going to expect now,” Simmons said.